This is Part Four of a five part series about how I grew my storytime attendance. In the past three years since I took over storytime, I’ve increased our program attendance by 61% compared to the last successful season. (For the statistics nerds out there, I’m comparing Summer 2009 from before I took over to Winter 2012/2013.) And I promise that these are simple measures that almost every library can do, regardless of budget. This is going to be a short and quick entry, because this is super simple to implement — personalize your storytimes. The more familiar you become to your storytime families and vice versa, the more important storytime becomes to them and the more parents will value your advice and tips. Learn the names of your storytime kids. Use nametags if you have to, or registration sheets. Learn the names of your storytime parents! They are coming and participating too! If you’re using themes, add in themes you know they’ll love and relate to! When I had only three or four year-olds boys for a few weeks running, I decided to do a dinosaurs theme since I knew they’d be over the moon. Last August, I did a “School” theme at the end of summer to help the kids going to grade school adjust. If you can, send home extra take-home sheets or coloring pages for siblings that used to come to storytime. Since my library does coloring sheets all the time and we have the budget for it, there’s no problem to send Lupita home with a sheet for Danny now that he’s in school. Provide read-a-likes! I have a ridiculously scary memory, so I remember from week-to-week that Bella really loved “Hilda Must Be Dancing,” so I pulled out “Brontorina” for storytime a few weeks later. Guess what? Bella loved that one, too. Share details of your life. When I sprained my foot last month, I explained that I couldn’t stomp my foot during the welcome song. This week I had Damian say to me, “Remember when your foot was hurt? It’s better now!” Another Mom asked me about library science since she knew what school I had attended. I’m sure there are many more things that you’ve done to personalize your storytimes! Let me know if you’ve got any other suggestions in the comments. I’d really love for this to be a great discussion, but that only works if you’re willing to share. This is Part Three of a five part series about how I grew my storytime attendance. In the past three years since I took over storytime, I’ve increased our program attendance by 61% compared to the last successful season. (For the statistics nerds out there, I’m comparing Summer 2009 from before I took over to Winter 2012/2013.) And I promise that these are simple measures that almost every library can do, regardless of budget. I know. I already said that you need stability and that preschoolers crave consistency. But once you get your routine established, shake it up every now and again. 1. Bring out surprises in storytime. On days when the kids have been remarkably wonderful or days when I sense the group needs a pick-me-up, I will often pull out the glitter and add it to our storytime craft. Just last week, I had bubbles at the end of my program. Do you give away stickers at the end of storytime? Get puffy stickers or fuzzy stickers for a treat! 2. Try something new. For about four weeks, I put toys out after storytime ended for kids to play with in our storytime room. When the kids started to stay after storytime, I moved it upstairs to our Youth Services area. Now kids can play while parents select books or talk to me about problems/concerns/ideas. I’ve heard everything from temper tantrums to picky eaters to toilet training — and I can get you the resources you need to help you out. This extension of storytime worked wonders for developing family relationships, but it only worked because I dared to try something new! 3. Find out what makes you excited to do storytime. For me, that was flannelboards. I *love* using and making them. If I need to get excited about a theme, I usually turn to the flannelboard. I make sure to do a different flannelboard every week. (That’s not to say I’ll never re-use flannelboards though, I just try not to in a single storytime session.) Even if our song cube is the same, and I’m reading familiar books — kids see a new story or rhyme every week on the board. 4. Take breaks. 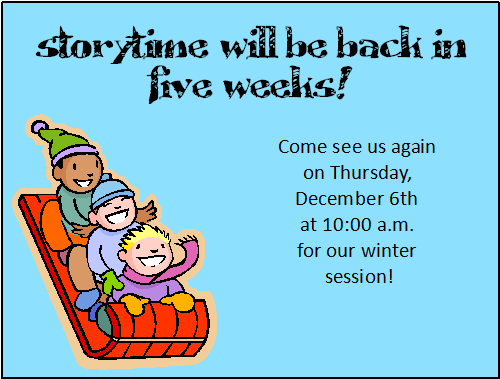 I run four storytime “sessions” a year. (September-October. November Off. December-January. February Off. March-April. May Off. June-July. August Off.) Those months off give me time to recharge, to develop new initiatives — like Growing Readers, to create new storytime props & flannelboards, to focus my attention on weeding or creating Picture Book City. And like I said in Part One, be honest and transparent towards families about why you need a break. If you can’t take time off, see if someone else can cover for you for just two weeks. I truly believe you’ll feel re-energized when you come back to storytime. There are lots of other ways to keep storytime fresh for both you and your patrons! If you’re struggling to find out how to liven things up, ask a co-worker to observe your storytime — I bet they’ll help you brainstorm. Ask for help on Twitter or listservs, librarians are out there and ready to listen/help. And if you have any questions for me, leave them in the comments or @katietweetsya. Logo designed by John LeMasney! This is Part Two of a five part series about how I grew my storytime attendance. In the past three years since I took over storytime, I’ve increased our program attendance by 61% compared to the last successful season. (For the statistics nerds out there, I’m comparing Summer 2009 from before I took over to Winter 2012/2013.) And I promise that these are simple measures that almost every library can do, regardless of budget. I touched upon my library’s revolving door of staff members in this ALSC post, but I’ll recap here. Essentially, my library is super close to a library school. We’d hire a library student as an assistant, they would get their degree and then a full-time job, and then we’d hire another assistant. From when I started at my library in Fall of 2006 to when I took over storytime in Fall of 2009, six different librarians/library assistants had been in charge of storytime. 1. I picked a day for storytime and stuck with it, for a long time. Storytime had been bounced around the calendar from Tuesday morning to Monday nights to Wednesday morning, etc. If word of mouth had any hope to travel, the day and time for storytime had to be consistent. I picked Thursday mornings, based on our after-school programs and room availability. And I refused to move it for at least a year. Applesauce in his storytime chair! 2. After adjusting to six different styles of storytime presenters, I wanted to create traditions at my library — something that older siblings could tell to their younger siblings: “And then…at the end of storytime, Applesauce comes out! 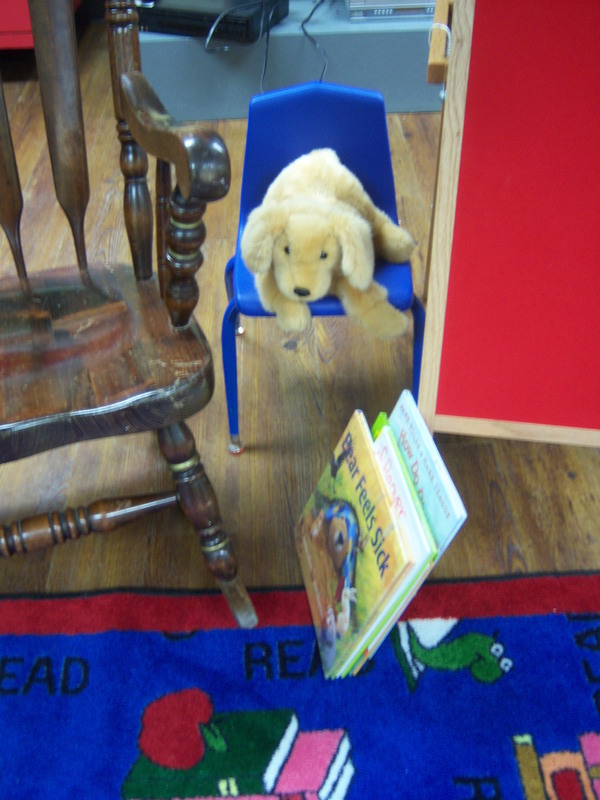 You can pet him, you can stick your hand in his mouth, he doesn’t have any teeth.” I bought a Folkmanis golden retriever puppet that can live at the library and be in storytime no matter who is doing the presenting. I have to say, it was a great, friendly puppet choice and I’ve never (knock on wood!) had a child scared of him. 3. After trying several different opening/closing songs, I went with a “Farmer in the Dell” rewrite for both. It’s only now — after two years of singing these songs — that my patrons are chiming in. 4. And it was also time to lay down the rules. I sat down and wrote some basic thoughts out, and wrote down the necessary storytime rules I needed patrons to know. My co-worker made a sign, I wound up re-vamping it recently to include picture cues for the kids. If rules are your thing too, you can download the PDF version of this (error free) at the original post. This move was for my parents. Once I started to build an audience, I wanted to make sure we were all on the same page for expectations. It took me about a year before I realized this and I wish I had done it much sooner. 5. I gave myself permission to re-use books, songs, fingerplays, and flannelboards. Yes, almost every preschooler knows the story of “The Very Hungry Caterpillar.” Does that mean when I pull out the flannelboard, they all moan and cry, “Oh no, Miss Katie. Not that one again!”? Nope. They squeal with delight, with recognition. And the one toddler who doesn’t know the book walks away with a new story that day. 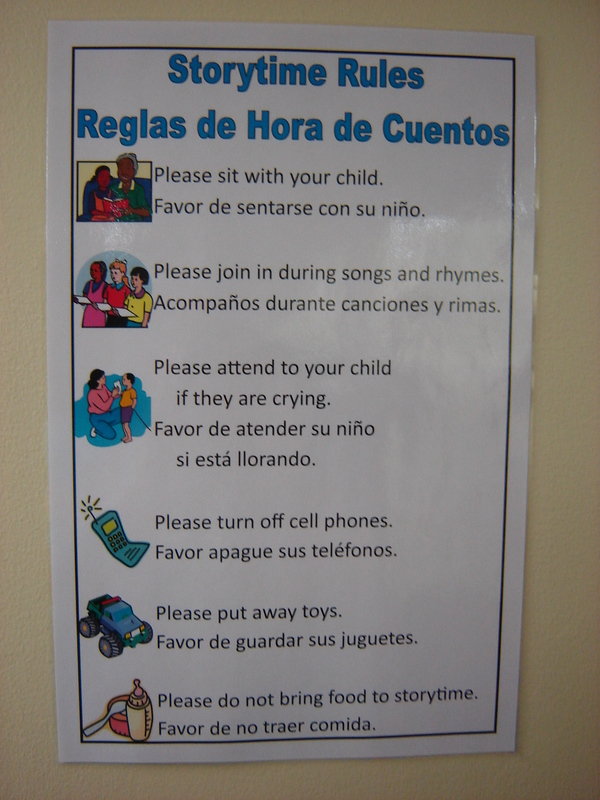 Not only did these changes help my community and my families, I really feel like they grounded me in storytime. By making these decisions and changes, I started to own my storytime style — which made it easier for me to do what I needed to do for my job. But owning my style also made me love storytime. It made me jump out of bed on Thursday mornings and get to work already in a good mood, ready to face the day and the growing groups of preschoolers. This is Part One of a five part series about how I grew my storytime attendance. In the past three years since I took over storytime, I’ve increased our program attendance by 61% compared to the last successful season. (For the statistics nerds out there, I’m comparing Summer 2009 from before I took over to Winter 2012/2013.) And I promise that these are simple measures that almost every library can do, regardless of budget. Of course, we all know that our storytime parents are running all over town often balancing kids, work, school, home, and all those activities and fun things. But after a session of storytime that had 20 sign-ups, but literally ONLY one child and caregiver showed the whole six weeks that we were scheduled, I had to re-evaluate how to help my busy families. 1. I started doing reminder calls the night before a program. Simple, about a twenty minute process that my paraprofessional staff does on Wednesday nights. It’s a quick speech, “Hi, this is the library calling to remind Sophia that she is signed up for storytime tomorrow, May 2nd, beginning at 10:00 am. Hope to see her there!” When a parent signs up for storytime, I explain our reminder calls are a courtesy since families have tons of activities to keep track of on their schedules. 2. Since I knew that parents were worried about being late, I pushed back the start of storytime, but only in actuality! All of our publicity states that storytime begins at 10:00 am, but I do not take anyone into the storytime room until 10:05 am. This gives parents a five-minute cushion for when their child doesn’t want to put their coat on or if the baby decides to spit-up on themselves the minute they’re put in the car seat. 3. Roll-over sign-ups. If a family has been regularly attending storytime in the Winter session, I will automatically sign them up for the Spring session. My families love this, though I know it’s not always possible for every library. But there are tons of ways to make sign-up easier for families, I’ll help you brainstorm if you’re stuck! 4. Reminder cards for the breaks between sessions. At the last session of storytime, I pass out these cards so parents can stick them on the fridge and have a visual reminder about when the next storytime session will be starting. Hopefully it doesn’t get lost with all the storytime crafts displayed next to it! 5. And as for attendance, I do not require families to attend every week of the session they’ve signed up for. I don’t use strikes or count it against them if they can’t make it. Parents who miss every session do not qualify for roll-over sign-ups, but they always have a chance to re-register, as long as the program is open. That brings me to the end of Part One! I think the biggest tip I can give with regards to parents and families is to be transparent. Occasionally I’ll have a new mom asking me why we’re not going into the storytime room right away, and once I explain about my five-minute cushion, I get the slow head nod of approval. By answering questions honestly, and explaining to parents and caregivers the benefits of the rule for *them,* storytime becomes an activity that takes their busy lives into consideration instead of another thing to fit in on the schedule.